How much do you know about global food security? Do you think you know all there is to know about global food security? News website The Guardian has created a quiz to test your knowledge on the international issue and included a few questions on food waste. So go on, test yourself – you may learn something about the relationship of food waste to the bigger issue of food insecurity. At a recent food-waste event, the manager of a leading food-recovery charity joked to the audience, “We want to reduce food waste, but at the same time, we want it because we use it to feed hungry people”. This comment suggests that food waste is the solution for food insecurity in the city. Each draws a connection between hungry mouths and excess/surplus food. At first glance, you can’t be blamed for thinking that food-insecurity and food waste are two problems that together, solve each other. Misunderstanding #1: Aren’t food recovery groups doing a terrific job diverting food from landfills? Sure! Food recovery groups play a critical role in saving food before it becomes “waste.” I strongly believe in them, and volunteer myself. But we cannot forget that they represent David against the Goliath that is food waste globally. Any conversation that portrays food recovery as the solution for food waste is misleading. In reality, the scale of food waste is gargantuan. For instance, refer to City Harvest’s outstanding accomplishment above: they rescue 136,000 lbs of edible food EVERY DAY in New York City. 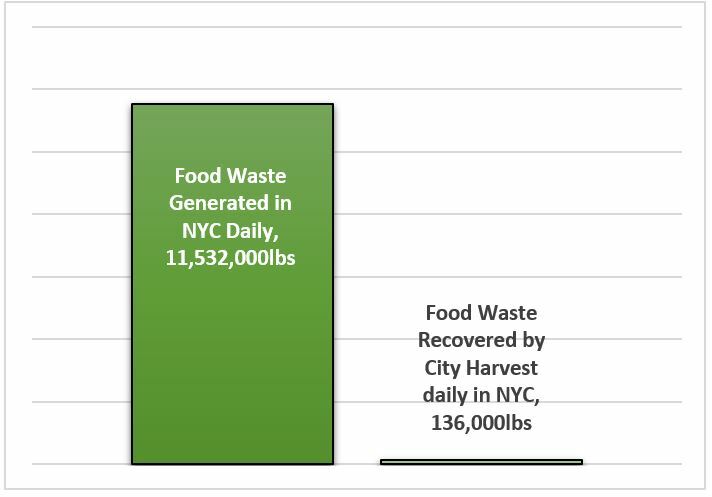 However, consider that against the ~11,532,000 lbs of food waste the city generates daily…and it quickly becomes apparent that food recovery is not a meaningful solution for an overwhelming food waste crisis. Overall, less than 5% of food waste in America is diverted from landfills, and this encompasses all forms of diversion (biogas, composting, animal fodder, not just food charities). Misunderstanding #2: Isn’t the vast quantity of food waste a terrific way to solve hunger? Unfortunately, even with unimaginable levels of food being thrown out, food banks and charities are unable to eliminate hunger. They are far from reaching all food-insecure individuals. 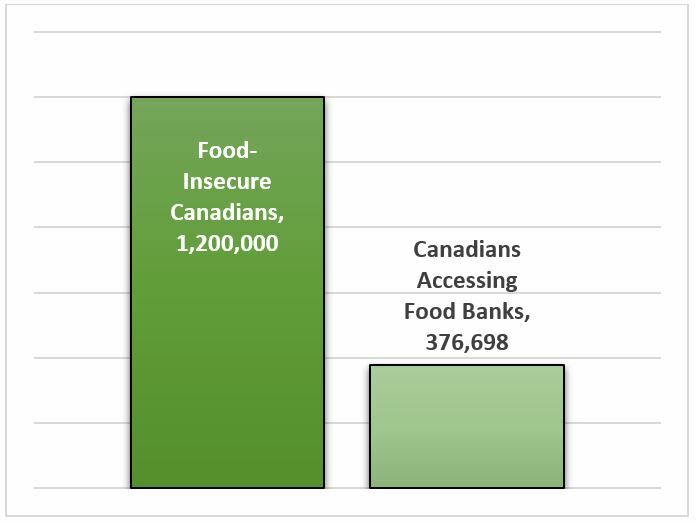 Food Banks Canada, for instance, reported serving 374,698 Canadians in 2014…only a sliver of the 1.2 million Canadians who experience food insecurity. Many reasons account for this, including access or informational barriers, unsuitable food offerings, and the sense of shame associated with charity food procurement. In short, the charity food recovery model does not have the capacity to end hunger. So when considering Feeding America’s mission of “solving hunger” and “feeding America’s hungry” (see above), we must question if this current charity-based strategy will ever bring this goal to fruition. Food Recovery is not SOLVING food waste or hunger. So what could work? Let’s be clear: food banks and soup kitchens were designed to fill a short-term need. However, every year more people come to depend on them, thanks to the retreat of government from social service provision and escalating levels of poverty. Charity cannot end hunger. Hunger is an issue of poverty; and poverty is a problem for policy. Luckily, some organizations are recognizing the limitations of the charitable food-recovery model and turning toward the core issues. On the hunger front, some groups are starting to work beyond food handouts. They are looking “upstream” to address issues such as housing, inadequate wages, and the lack of social services for the most vulnerable. Addressing these deeper issues will help lift people out of poverty, making them less dependent on food charity. 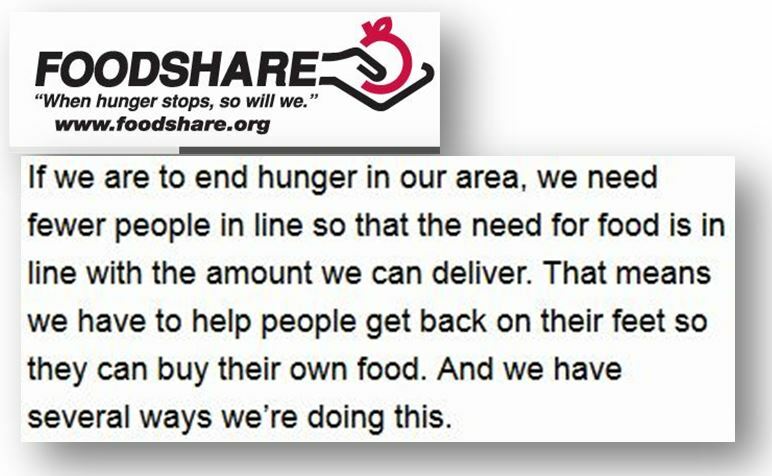 FoodShare, for example, engages in advocacy in tandem with its food-hamper handouts. Community Food Centres Canada runs food-skills education and advocacy groups alongside its food access programs. Their efforts focus attention squarely on government, highlighting that the voluntary sector ought not, and cannot be responsible for the problems of hunger and poverty. Meanwhile, on the food waste front, groups such as Feeding5K, the Pig Idea, and LoveFoodHateWaste are working to identify the policy levers and affect change that will meaningfully reduce the amount of food waste being created. As individuals, we can help immensely by volunteering with food recovery organizations. But it is incumbent upon us to work for deeper change. This front-line work should only be part of our efforts, because the core problems of food waste and food insecurity need deeper policy change. I invite you to explore the organizations in your hometown that are working for long-term change, and contribute half of your energies into immediate short-term relief, but another half into advocacy for long-term structural change. Let’s work together, on various fronts, to eliminate these problems. Loopstra, Rachel, and Valerie Tarasuk. 2012. “The Relationship between Food Banks and Household Food Insecurity among Low-Income Toronto Families.” Canadian Public Policy 38 (4): 497–514.